The name “Docema” was derived, in all innocence, from the Latin verb docere, which means “to teach”. People who explain art to you in museums are called “docents” and it comes from the same Latin root. It proved that Docema’s founder, Bruce Twickler, could still remember some high school Latin even if he can’t remember what he had for breakfast. Conjugating a little can give you more options. For example, “we teach” would be “docemus” but the “mus” ending is a little mussy, I think you will agree, so “ma” was chosen instead, a little more artsy, everyone felt at the time. After a quick web search where the only competitor for the name was somewhere in Poland, we decided “Docema” would be a great name. And then it happened, like lightening, we realized that “Docema” encompassed the first three letters of the word “documentary” and the last three letters of the word “cinema”. Holy cow! If that isn’t a dancing lesson from heaven, to paraphrase Kurt Vonnegut, what kind of a miracle are you waiting for? 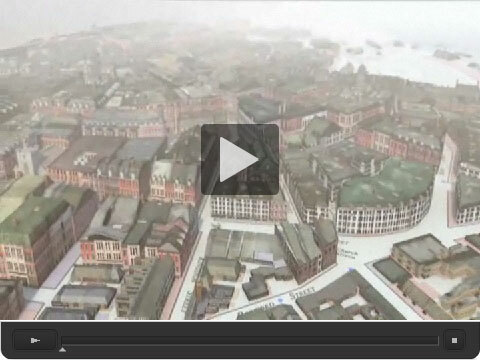 Docema is a Massachusetts film company that produces historical documentaries enlivened by dramatic narratives and what has become its trademark: extraordinary 3D computer animations. Docema was founded in 2003 by Bruce Twickler, who not coincidentally is writing this page. I am a software industry veteran who published, among other products, VideoWorks in 1985, arguably the first serious multimedia product on a personal computer (an early collaboration of Marc Canter and Jay Fenton, founders of MacroMind, later MacroMedia, more recently subsumed with Flash into Adobe) and, a decade later, VideoCraft, with its 1996 incarnation on the internet as The Amazing Instant Online Animated Banner Maker, one of the first graphic web apps, arguably. It did not take a genius to realize that high-performance software running on faster and faster personal computers would sooner or later be able to produce high-resolution animations with startling realism. By 2003 I felt that the tools were advanced enough to produce Hollywood special effects on a public television budget. My friend, Adam Green, told me that if I was going to do a film, I would need a story and a camera. He was right on both counts. The story we chose was, at first, a simple recounting of the Great Boston Fire of 1872. The fire burned down 65 acres of large buildings in the center of Boston. It still ranks as one of the five most destructive fires on record in the US and, in the 19th century, was second only to the Great Chicago Fire the year before. But this disaster was not well known even in Boston, which made it attractive to us as a subject: all the drama of a big fire, but not over worn. We looked for an office/studio space and the best we found was in the American Twine Building at 222 Third Street in Cambridge. It had the high ceilings of a 19th century factory, the same era as the subject of our first film, Damrell’s Fire. 222 Third Street was familiar ground. I had worked at a network company there in the 80s and, in the 90s, worked with DIVA, a company that developed a non-linear video editor. Eventually DIVA merged into AVID. The fact that DIVA was AVID spelled backwards had no bearing on the valuation as far as I know. 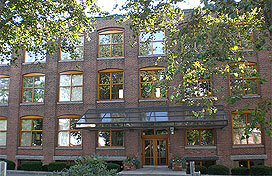 When we were in the American Twine building, I applied to the telephone company representative for a number. She gave us…617 (the ‘original’ Boston area code)…374 (an indifferent Cambridge exchange but it spells “erg” a unit of work)... and 1000... awesome! I had been in dozens of businesses in the last forty years and this was the first time I got a “1000” number... 617-erg-1000... A harbinger of things to come, we hoped. 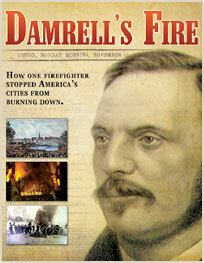 Damrell's Fire was first broadcast over public television stations in April of 2006. American Public Television, distributors of the program, acclaimed it as one of their most watched historical documentaries. With a Nielsen rating of 2.5 GRP, the the best estimate of viewership was between two and three million households. More important than the statistics, many firefighters have told us that it is the best fire movie they have ever seen! 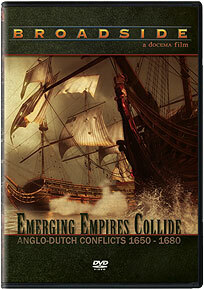 Our next film was Broadside, which centered on the little known but empire-making era of the Anglo-Dutch Wars in the 17th century. Finally we had a subject so arcane that even historians often skip over the details to avoid encumbering their narratives (like the raid on Medway…the biggest naval disaster in English history, or the Dutch giving up Manhattan, twice). It tells the story of wars for global empire set in the domestic political and social turbulence of both England and the Netherlands. It also shows how religious freedom came to America, how New Amsterdam became New York, how the Royal Navy developed, and how the Dutch, a country of just 3 million people, dominated world trade in their Golden Age. Broadside was first broadcast on public television stations in October, 2009 and is now licensed internationally by APT Worldwide.